Caffeine and ephedrine related alkaloids have recently been removed from International Olympic Committee banned substances lists while ephedrine itself is now permissible at urinary concentrations below 10ug/mL. The changes to the list may contribute to an increased use of caffeine and ephedra as ergogenic aids by athletes. 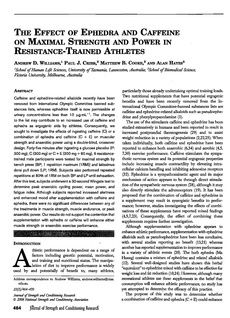 Consequently, the aim of this study was to investigate the effects of ingesting caffeine (C) or a combination of ephedra and caffeine (C+E) on muscular strength and anaerobic power using a double blind, crossover design. Forty five minutes after ingesting a glucose placebo (P:300mg), C (300mg) or C+E (300mg + 60mg), nine resistance trained male participants were tested for maximal strength by bench press (BP; 1 RM) and latisimus dorsi pull down (LP; 1 RM). Subjects also performed repeated repetitions at 80% of 1-RM on both BP and LP until exhaustion. Following this test subjects underwent a 30-s Wingate test to determine peak anaerobic cycling power, mean power and fatigue index. While subjects reported increased alertness and enhanced mood following supplementation with caffeine and ephedra, there were no significant differences between any of the treatments in muscle strength, muscle endurance or peak anaerobic power. Our results do not support the contention that supplementation with ephedra or caffeine will enhance either muscle strength or anaerobic exercise performance.